Free Comodo AntiVirus leverages multiple technologies (including on demand & on access scanning, email scanning ..
Free Comodo AntiVirus leverages multiple technologies (including on demand & on access scanning, email scanning, process monitoring and worm blocking) to immediately start cleaning or quarantining suspicious files from your hard drives, shared disks, emails, downloads and system memory with enhanced web lookup. It’s easy to install and configure, will not slow down your PC by hogging system resources and is free for life to the end user. 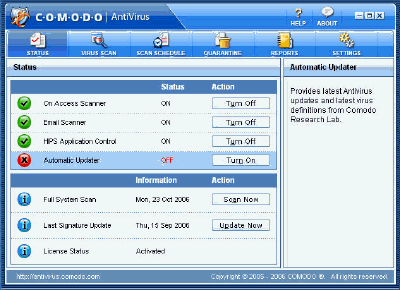 Comodo Free Antivirus stands out immediately for its versatile and flexible interface. You can view your security status and launch scans from a tiny desktop widget, a more conventional antivirus console, or switch to an Advanced View which gives speedy access to Comodo’s expert-level functions and features. You don’t have to get involved in the complicated stuff, of course. Newbies can use the program much like any other antivirus – click Scan, choose a Quick or Full Scan and wait for the results – but life does get more interesting if you explore Comodo’s other options. A Rating Scan, for instance, scans running processes and commonly infected areas and reports on the reputation of all the files it finds. This is interesting as it can show you files which aren’t clearly malicious, but are considered untrusted (both executables and certificates), as well as files that Comodo hasn’t seen before. If you suspect you’ve been infected by something nasty, but can’t prove it, the Rating Scan may be able to point you in the right direction. A powerful antivirus tool with some unusual and advanced features. There’s little data on its accuracy, though, and you’ll need real technical expertise to get the most from the program.